KeeGan is committed to bringing quality products and friendly after-sales service to Amazon buyers. As we know, this smart watch talk band will give users healthier and more convenient. Why do I say that? It is not only a smart watch but also a bluetooth earphone. On the one hand you can use it to answer or refuse to answer the phone and use the voice assistant to make calls and check the weather. 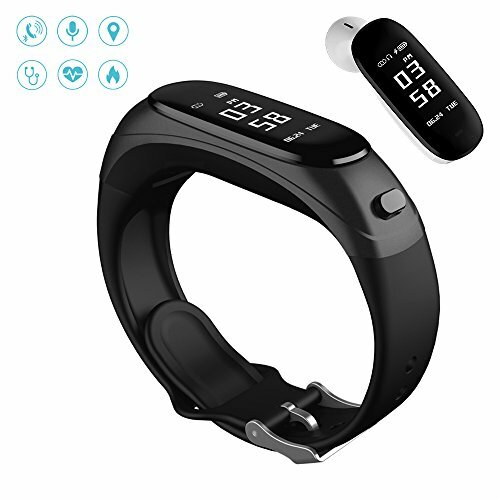 On the other hand, it includes the following functions: heart rate monitoring,auto-sleep tracking,running monitoring, searching for mobile phones, countdown operation,stopwatch operation,alarm clock and important event reminders, information push, sedentary reminder, remote camera. There is nothing more important than health. If you choose it, you will be able to understand the physical condition all day. Do not hesitate and choose it decisively,it's worth your own. If you have any doubts, you can contact us on the Amazon platform and we will reply to you as soon as possible. Fitness Bracelet with Voice Control:Make calls, search for memos, send text messages, just need you to speak.what you want to do is just need to talk to fitness bracelet. Smart Bracelet with Heath Monitor: 24 hours monitoring the user's heart rate, sleep quality, blood pressure timely feedback to the user's physical data. Activity Tracker:Help set a scientific daily exercise task,automatically record the number of steps, calories consumption, mileage, display the trajectories formed by gps tracking, synchronize feedback the data. Smart Bracelet & Earphone :Fitness wristbands daily non-stop guarding your health, Bluetooth earphone to make communication more convenient. What You Get: A smart bracelet, a charging cable, reminder card, a charging dock,two earphone sets,a user guide,24 months warranty and friendly service. If you have any questions about this product by KeeGan, contact us by completing and submitting the form below. If you are looking for a specif part number, please include it with your message.